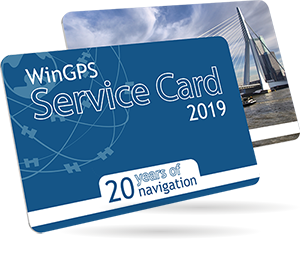 There are only a few days left to purchase the WinGPS Service Card 2019! Up until the 22nd of February 2019 the Service Card will be available. By purchasing the Service Card we can garuantee you have the most up-to-date version of WinGPS 5. Thanks to all the changes and new functions we add to WinGPS 5, you can assure yourself of having a safe navigational system at all times. When you purchase the Service Card you also give us the means to keep improving our software and provide you with an even better product. Be the first to receive WinGPS 5 2019 (worth € 70,-). All updates for WinGPS 5 2019: route network, bridges & locks and new features. Early acces to the exclusive bèta version of our WinGPS app for iOS. € 20,- discount on all 100% Stentec DKW chart sets 2019 editions. Free NLTides currents & tides for 2019 worth € 19,90 (Pro and Voyager). Free installation of Stentec products (in our store in Heeg). Exclusive fair and event offers. In 2019 we will focus our attention on improving on the user friendliness of WinGPS 5. Important parts in user friendliness are, for example, a clearer menu structure, better accessibility and findability of functions and an easier way to update GRIB files and shipping notifications. In the last update for WinGPS 5 - 2018 we added the option to load IENC charts. For the 2019 edition we want to improve on this function and add extra options which make it possible to make optimal use of both IENC and DKW charts.